Why silicon photonics is so difficult, and why it’s becoming more popular. Silicon photonics is gaining significant traction inside the data center, but creating a simpler method of packaging the laser with other circuitry remains a stumbling block for cutting costs and using this technology across a wider swath of applications. Progress does appear to be on the horizon, even though exact time frames remain unclear. The advantages of light in communications are well known. Photons are faster, cooler and lower power than electrons. Moreover, there is virtually no limit to the amount of data that light can carry over both long and short distances. Fiber optics have been in commercial use since the mid-1970s, and they have been undergoing improvements ever since. Silicon photonics is a more recent addition, rolling out in something of a piecemeal fashion since the early 1990s. 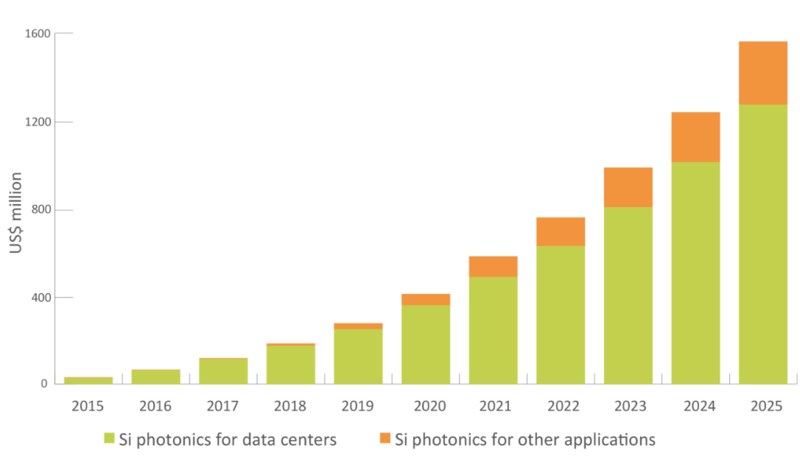 Commercial usage of silicon photonics started beaming to life last year in data centers, and the overall market for this technology is expected to grow significantly over the next decade. Silicon photonics for applications outside the data center are being readied, as well, with sales expected to starting to ramp slowly sometime in the next few years. That is consistent with market projections from forecasters such as Yole Développement. The reason for the delay within packages is related to both cost and technical issues. Harnessing light in a package has proven much harder than having an external laser source because the laser typically relies on a III-V material such as indium phosphide (InP), which has to be bonded somehow to CMOS-based circuitry. This is not a simple problem to solve. In fact, IBM’s Thomas J. Watson Research Center recently developed an adhesive the company described as an “innovation.” Intel has likewise developed its own bonding technology to couple the light source to the waveguides, which are to photons what wires are to electrons. Another problem is how to attach fiber to the package so that data can move smoothly from one part of the package to another, and from the package out to external fiber optics. Vertical coupling is more “photonics” in nature, said Lamant, and appears to have a potential for higher fiber count. Lateral/edge coupling appears to be more compatible with electronics, but it could be limited by the number of fibers it can handle. Intel‘s approach to this problem is quite different, although the goal is the same, namely creating a process that can mass produce these devices to scale like other semiconductors. Intel starts with a 300mm silicon wafer, and 4-inch indium phosphide wafers. The InP wafers are diced and then flip-chip bonded to the silicon wafers in a single bonding step, according to Robert Blum, director of strategic marketing and business development at Intel Silicon Photonics. Another issue involves how to connect the photonic chip to the networking IC. Today’s solutions require a standard plug with the optics (QSFP) that is connected via long copper traces. With silicon photonics the optics can be placed in close proximity to the networking silicon, reducing the overall power budget and space required. Fig. 3: External connection of photonics package. Source: Intel. Intel’s big achievement last year was that it moved into production with a mature process and high yield, Blum said. That is a first step in dropping the price of silicon photonics to a level where it is competitive with existing packaging. Seyedi noted that changes to the interconnect and the basic technology for the lasers can further reduce the cost. He said the most likely path is for OSATs to expand downstream and to acquire the necessary equipment and expertise. But while this market is growing, it’s still a work in progress, and companies that intend to stake out a role in photonics are moving cautiously. And then there is debate about how long a photonics chip needs to last. The light source stops producing light over time, which means the entire module becomes useless. Initial implementations lasted an average of 15 years, which is more than triple the amount of time that data centers actually keep equipment before scheduled upgrades. But the cost was so high that companies began looking at reducing that lifespan to save money, according to industry sources. The current qualification ranges between 7 and 10 years. But the testing needs to become more standardized along with that, and it needs to be at a system level. Blum said Intel’s approach is to do a full test at the wafer level after the III-V material has been attached and processed. Not everyone is taking the same approach, though. Silicon photonics currently does not require the most advanced manufacturing process nodes. That means a variety of EDA tools should work to develop these chips. That isn’t always the case, however. Rey noted that photonics IC developers currently are using optical proximity correction tools, as they would for a standard semiconductor. But he said the increase in complexity will likely push them toward inverse lithography. That reticle enhancement technique, which has been available for about a decade, enables an optimal photomask pattern by improving the process and depth of focus of lithography. Photonics chips may be one of the key drivers for more widespread use of inverse lithography, as well as a number of other more specialized tools. The EDA industry has been watching silicon photonics closely since the beginning of this decade, and its ramp up inside of data centers may be a signal that this technology is beginning to gain critical mass. Silicon photonics has come a long way since a few years ago. Over the next few years it is expected to grow significantly as a way to move large quantities of data back and forth inside of datacenters. But that’s just the beginning of where this technology ultimately is heading. As the technology in silicon photonics matures and as more problems are solved, it likely will play a role in performance-driven applications where price is more flexible, such as servers and networking equipment. And as more of the essential components are moved first to PCBs, and from there to fully integrated packages, photonics will begin to show up in many more devices. The only question is when. What is the role of EDA in building photonics systems, is a viable IP market developing and how are photonics systems tested? Are we there yet? Where is the demand coming from and which types of product will drive innovation? Using light to move data will save power and improve performance; laser built into process technology overcomes huge hurdle. Ed, you need to look and recent developments at LWLG (lightwave logic).